What kind of row cover should I buy? Light-weight (0.5oz/0.9oz)have 90%-95% light transmittance, 2o-6oF. 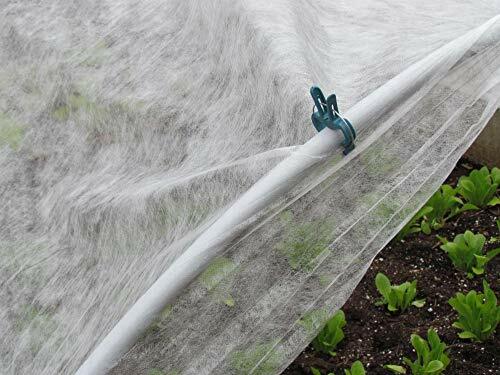 of frost protection, and can be left on many crops (e.g., beets, snap beans, salad greens) from seeding to harvest. Medium-weight(1.2oz)covers help speed up crop maturation and increase yield. They are useful for extending the season in both spring and fall by retaining some heat. Heavy-weight (1.5-2.2 oz) are usually used to extend the growing season in spring and fall, allow 50%-70% light transmittance, and 4o-10oF. of frost protection. Row cover can be draped directly over plants and held to the ground with rocks, boards, bricks and sod pins.The growing plants push the cover up, if you give it enough slack. Alternatively, you can erect simple frames to support plant cover above your plants. UniEco offer 100% GUARANTEE, If you are not satisfied with your purchase you can return these plant stakes for a full refund! If you have any questions about this product by UniEco, contact us by completing and submitting the form below. If you are looking for a specif part number, please include it with your message.